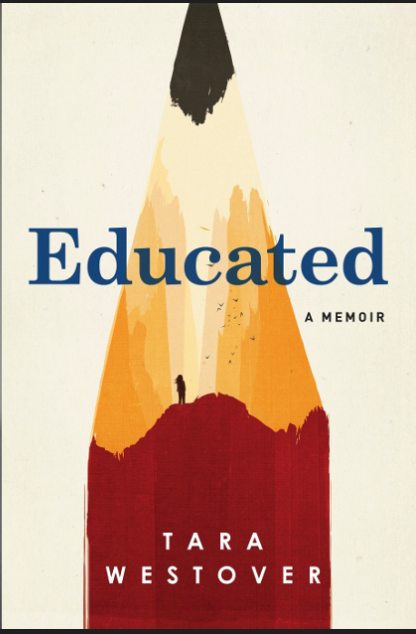 I just finished the book, Educated: A Memoir, by Tara Westover. I was completely blown away by this story. As a child, Westover was not permitted to go to school by her father, who would prefer her to work in his junkyard instead. Her parents did not believe in education or in modern medicine, but they believed strongly in the power of God. As a result, Westover and her six (I think?) siblings were were constantly exposed to terribly dangerous situations (God would protect them), and when they got injured, they were not taken to a doctor. On top of all of that, one of Tara’s siblings became more and more violent towards her as they grew up. And her dad was constantly convinced that the end of the world was very, very near. They lived on a mountain in Idaho, where he probably still has stashes of food and gasoline underground. I guess it’s not really a spoiler alert to say that Tara escaped all of this and became highly educated, eventually earning a PhD. But the story of how she got to that point is amazing. I recommend this book without reservation to everyone. This writing brought to you by the Art of the Month Club. My daughter brought this book home from the fourth grade book swap. ﻿The fourth grade book swap just isn’t what it used to be, is it? They grow up so fast. Sigh. Inside the back cover, we read that this book is about a newly divorced Londoner who goes to Vermont and stumbles upon a two hundred year old diary of a beautiful lady, who manifests to him in person, somehow. Sounds great for a nine year old reader. Except, it needs horses, doesn’t it? I suggest Steel change all of the characters in this book to either horses or puppies, to make it more palatable for the fourth grade book swap crowd. 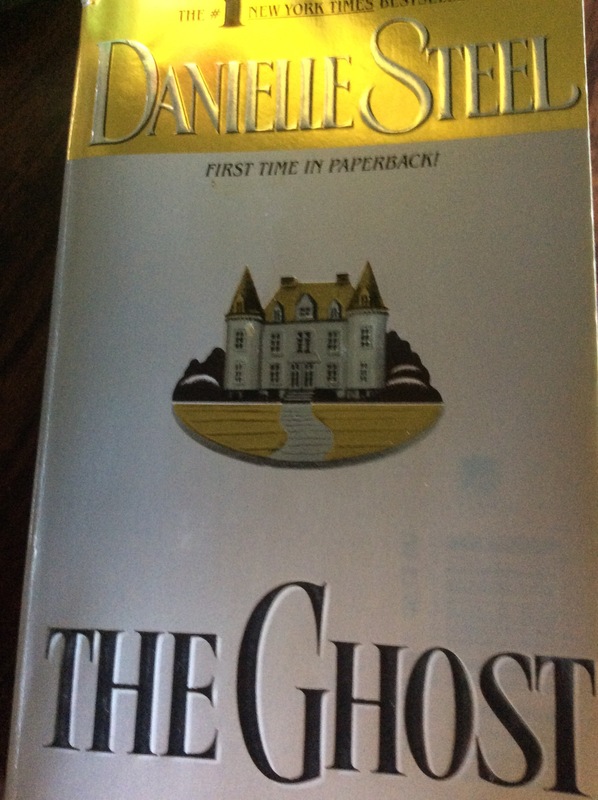 Although, in defense of including it, it does actually say, “Everybody reads Danielle Steel” on the back cover. What is up with this author photo, by the way? 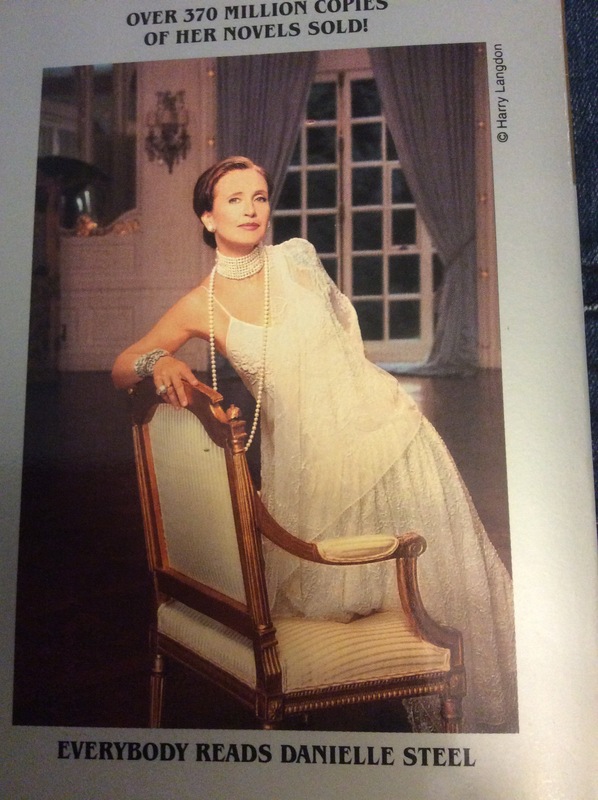 I so want an author photo of myself like this. Could anyone help me with this? 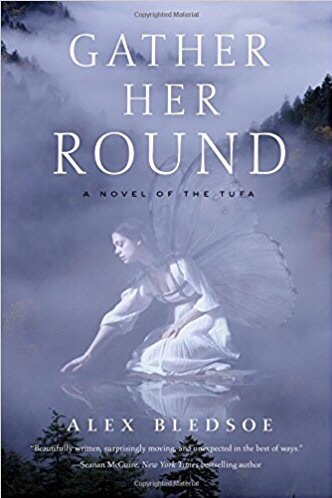 I read and reread the past four Tufa books very carefully, looking for things that would create beautiful scenes in a coloring book. (I drew The Tufa Coloring Book.) So, I was relieved recently to crack open Alex Bledsoe’s latest book, Gather Her Round, and just, you know. Read it. Having read the previous four so closely further enriched my reading experience of the fifth. I knew what to expect, and when I found it, it was comfortable and cozy. And then when the unexpected happened, that made it all the more exciting. – The magical forest as a setting. – The strong female characters. – The tribal rituals elevated to a higher level of intelligence. – The outsider discovering the Tufa for the first time. – Rednecks as real, relatable people. – The clash between the two Tufa groups. – Riding the night winds! All that, and more, of course. Gather Her Round most notably also has a mythical beast, really more of a horror story type beast, but written without excessive gore. We don’t know if the wild boar is a normal pig escaped from a farm, or something conjured by a haint, or if it’s, as the fortune teller says, “mostly real,” but not entirely. Perhaps the Night Winds conjured it? The mystery of the whole thing kept me reading. And then there was also the guilt of not really killing someone, and not really not killing someone. It made for a good story, well told. Oh, and it’s a story within a story, one of my favorite things! (cue Julie Andrews) The whole tale is told by a Tufa keeping everyone on the edge of their seats at a storytelling event. The Prince should be a vampire. 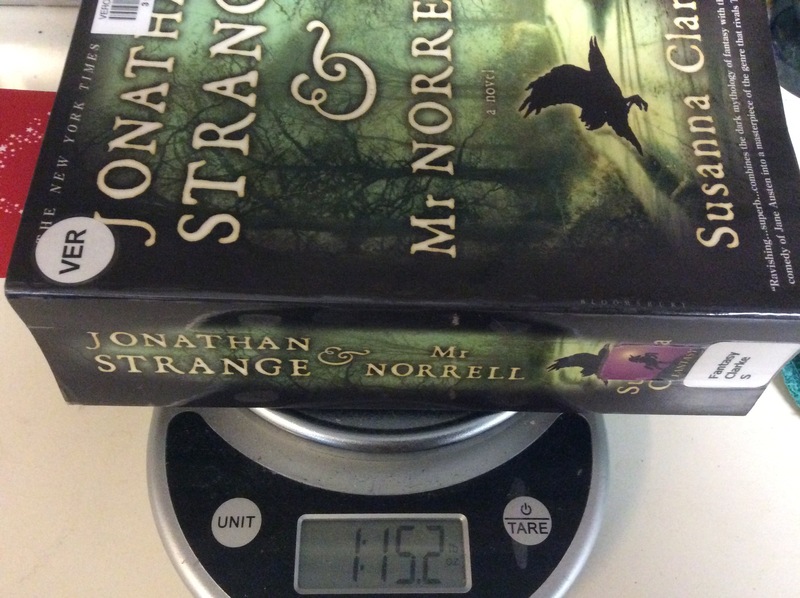 We should add Jonathan Strange, this book needs a magician! All of the men should be women. All of the women should still be women. All of the swords should be cats. 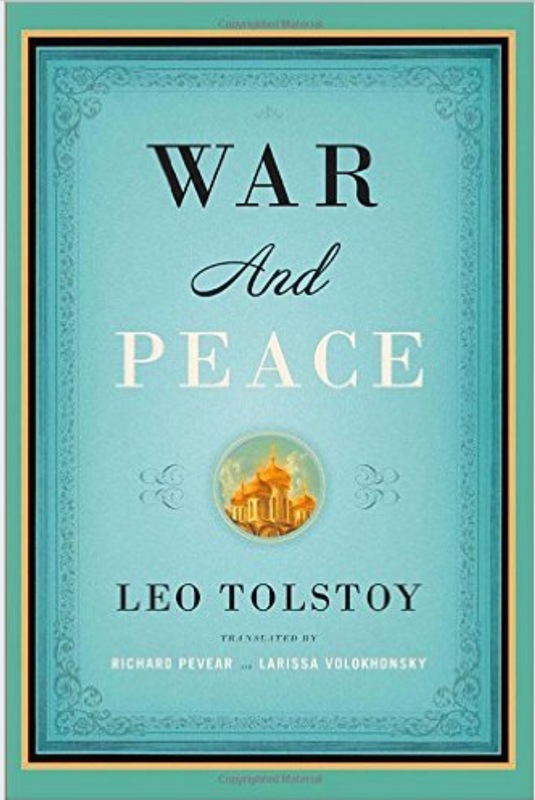 This way, War and Peace will be the best book ever. It’s like an historical novel, but the history is completely made up, because it’s a fantasy novel. She has footnotes that reference books that never were. It’s funny. I had to buy reading glasses to make out the footnotes! (Another reason to get it on kindle.) But whatever hardships I went through to read this book were entirely worth it for the pure entertainment value. The characters are very true to human emotions. The wit is dry. The plot centers around two magicians in England around the time of the Napoleonic wars. They are rivals, and amazing magicians, but also goofy and not all that amazing as people. Mr. Norrell has a simple wish: to be the only magician in England. So, he collects all of the magic books and hides them away, so no one can learn how to do magic. Jonathan Strange has a simple wish: to share magic with everyone in England. Then you throw in the gentleman with the silvery hair, an evil fairy who kidnaps people each evening from England and makes them dance all night in his ballroom of horrors, but whenever they try to tell other people in England about it, everything comes out as nonsense. The true joy in this book is reading all of the little details of the lives of the minor characters. Even the subplots have subplots, and then footnotes. And then more subplots. The TV series is fairly true to the book, but the ending is different. I like the book ending much better. As usual, the book is better all around, with all of its juicy little details. The biggest surprise of all was at the very end, when I read that this was Susanna Clarke’s first book. Seriously? She has achieved quite a level of excellence for a first novel. I can’t wait to read her second. 1. Immediately, I was drawn into this book. Kostova is a master of language. “My dear and unfortunate successor,” begins the letter that changes everything. (I now want to start every blog post here, “My dear and unfortunate reader.”) She writes in a few different styles, depending on who is speaking, but it’s always old-fashioned. To read this book is to enter into a world where cat memes never existed. And that is good. 1. The present day, referred to in the forward and afterward. 2. The 1970’s, when the narrator was a teenager. 3. The late 1950’s, when the narrator’s parents met and went searching for Dracula. These stories are first told to her by the narrator’s father, and then later told in found letters from her father. 4. 600 years ago, when Dracula was alive. (Alive and not undead.) This is told in letters from monks. The monks’ letters are honestly a bit tedious, but well done. I’m actually not sure if the author made up the monks’ letters, or if they are truly historical artifacts from the real world. 5. I’ve never been to Eastern Europe during the reign of the Soviet Union, but now I feel like I have, a little bit. 6. This book reveals the inner workings of a secret society! 7. The Historian is a fairly long book, over 600 pages, and if you really love the writing style like I did, it’s nice to luxuriate in that story for a few weeks. I liked that it was long. So, basically, I liked everything about The Historian. I rate it five out of five Birds in Beards. Five out of five “Birds in Beards” means this is a wonderful read. My ultimate goal in life is to read everything Dwayne Fry has written. But my “therapist” (that voice inside my head that I feed Port wine and Wheat Thins) says, “Baby steps, Shoshanah. One book at a time.” Most recently, I read Dwayne Fry’s book, Sarah With The Black Hoodie and Other Rotten Tales. And, honestly, I didn’t even finish it. I was just so taken with the first story that I had to write a blog post about it. For those who have never read Dwayne Fry, the thing to know is that he is king of the short story. And then the other thing to know, not about Fry but about me, is that I have read Little House on the Prairie out loud a few times. I live in Wisconsin, where the original Little House in the Big Woods is set. This really kindles our imaginations here abouts, especially for the younger folk. And the thing I’ve learned, reading the Little House books out loud, twice over? Don’t think about it too hard, or you’ll realize that “Pa” is a freaking crazy dude, not right in the head, that his wife is his slave, that he makes his family pick up and leave, every time life gets almost bearable. And why? Why do they have to move again? Across the tundra? Why do they have to build a new house and start all over again? Well, Pa thought there were too many people. Or Indians. Or something. Which brings us back to Dwayne Fry. The first tale in Sarah With The Black Hoodie and Other Rotten Tales is a parody of Little House on the Prairie. Apparently, I was not the only one who read the Little House books and thought Pa was a jerk. And that makes me happy. Very happy. And it’s a good parody. I laughed out loud, as they say. A lot. I suppose I should read the whole book before writing a review, but you know what? It’s 99 cents. Just that first story is worth 99 cents. Thank you, Dwayne a Fry. I no longer feel alone in thinking Pa was a freak.